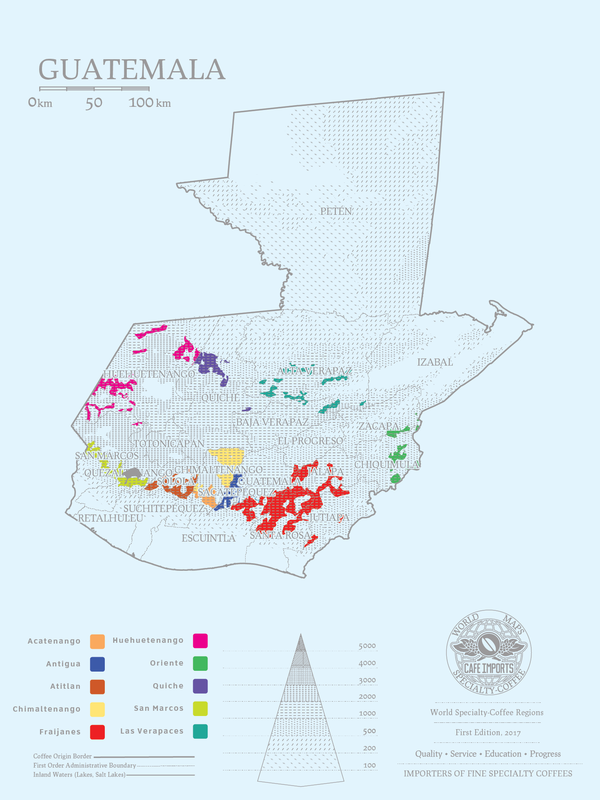 A large percentage of Guatemala’s population, and therefore also the coffee sector, identifies with one of more than 20 officially recognized indigenous groups, and most of the farmers are smallholders who are either working independently of one another, loosely associated by proximity and cultural ties, or formally affiliated in cooperative associations. In 1960, coffee growers developed their own union, which has since become the national coffee institute Anacafé (Asosiación Nacional del Café), which is a research center, marketing agent, and financial organization that provides loans and offers support to growers throughout the various regions. Starting in 2012 and lasting for several years, an outbreak of coffee-leaf rust proved a tremendous obstacle for coffee production in the country, reducing yields by as much as 25%, and causing the government to declare a state of emergency. Farmers attempted a combination of chemical and organic treatments, intensely targeted pruning, reduction of shade plants, and replacing susceptible varieties like Bourbon, Caturra, and Catuai with more leaf-rust-resistant ones. Anacafé, has been working closely with World Coffee Research on variety trials and research that will hopefully result in future protection and prevention of similar outbreaks, as well as provide more productive harvests for the smallholder farmers. Despite its relatively small size, Guatemala’s coffee-producing regions have distinct regional profiles that are influenced primarily by varieties and microclimate. Café Imports primarily works in four of the main growing regions. ANTIGUA has farms mostly between 1300–1600 meters, many situated on one of the three main volcanoes, called Agua, Fuego, and Acatenango. The volcanic soil helps lock in moisture, as the region is sunnier and tends to get less rainfall than elsewhere, and the coffees are sweet, smooth, and good for blending or as mild, lower-acid single-origin offerings. ATITLAN has a very rich soil composition thanks to the volcanoes that surround Lake Atitlan. The windy and wet climate contribute to the nutty, chocolate characteristics that are balanced by a lemony acid and some florals. NUEVO ORIENTE is a small region to the eastern edge of the country, butting up against the Honduran border. Its climate is cloudier and rainier than some of the other regions, and the relatively stable temperatures and limited sunlight create a full-bodied coffee with loads of balance. In addition to developing relationships within several of the district growing regions of Guatemala, which creates a diverse menu of offerings from which roasters can choose, we are also pleased to highlight those profiles with our stratified buying and Regional Select programs. Marathon cupping sessions have allowed us and our partners to identify and sort coffees by producer, lot, and quality—which creates the ability not only to single out microlot-level quality but also to blend the lots of may smallholders within a community or geographic area to highlight regional characteristics in the coffees. Our Regional Select offerings are built from those coffees which cup between 84–86 points, with higher-scoring selections earning premium prices as well as separate recognition among our microlots. This allows smallholder farmers the opportunity to place a larger selection of their harvest into the hands of the same buyers, which provides not only price stability and market access, but also the ability to enjoy recognition and gain valuable feedback about their production.